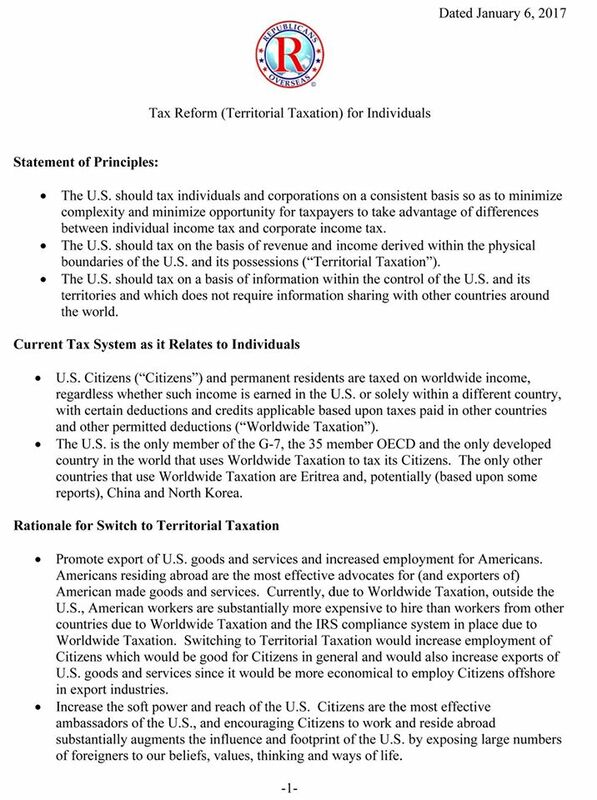 “Republicans Overseas Action releases White Paper on Territorial Tax Reform for Individuals. · Increase the soft power and reach of the U.S.
· Encourage skilled immigration to the U.S.
« Contact US House Ways and Means Committee re Tax Reform NOW! India recently closed a double-non-tax ‘loophole’ in its treaties with Mauritius and Singapore. Before this, Indian money could round-trip through entities based in these countries, neither of which have a capital gains tax. The IRS Taxpayer Advocate’ December report – published in January (“National Taxpayer Advocate’s Reports to Congress: “The second report (Annual Report), delivered at the end of December, includes: A summary of the 20 most serious problems encountered by taxpayers; recommendations for solving those problems; and other IRS efforts to improve customer service and reduce taxpayer burden.””) should be available to the public in a few days. May have some useful critique of current treatment of those ‘abroad’. Note, I am not endorsing the services of the author, merely pointing out that he has many useful and well written and valuable researched resources of relevance to those ‘abroad’. And is also one of the ACA’s Professional Tax Advisory Council (PTAC) members. There are many articles available fulltext through the website; several which focus on the evolution of the US FBAR, treatment of Canadian pension plans, etc. Again, not meant as an endorsement or advertising of his services, merely bringing the resources to your attention in case citing them may strengthen presentations against CBT by illustrating what a respected US tax lawyer has published on the layers of the CBT burden – complexities, illogic and confiscatory penalty structures. I have NOT yet read the article above in detail however it seems to me at first blush to be misguided. Please forgive me if I am shooting from the hip. In my view the issue ought to solely be taxation based on actual residence not type of income, green card status or anything else. The withholding taxes that different types of income are subjected to is a matter normally dealt with in Tax Treaties between countries. Indeed the above table cites “removal of treaty benefits” in a number of situations. In fact this territorial taxation proposal seems to introduce a bunch of complications and new taxation. It would, if I read correctly, introduce a capital gains tax on foreigners living abroad when they make gains in the US. By eliminating treaty protection, this means people investing in the US could be double taxed: at home and in the US. So basically this says: we don’t care about what happens in your home country, we will tax you. On the other hand it would exempt from taxation gains realized abroad, even for US residents. In fact you could have a business abroad and reap benefits from it without tax. 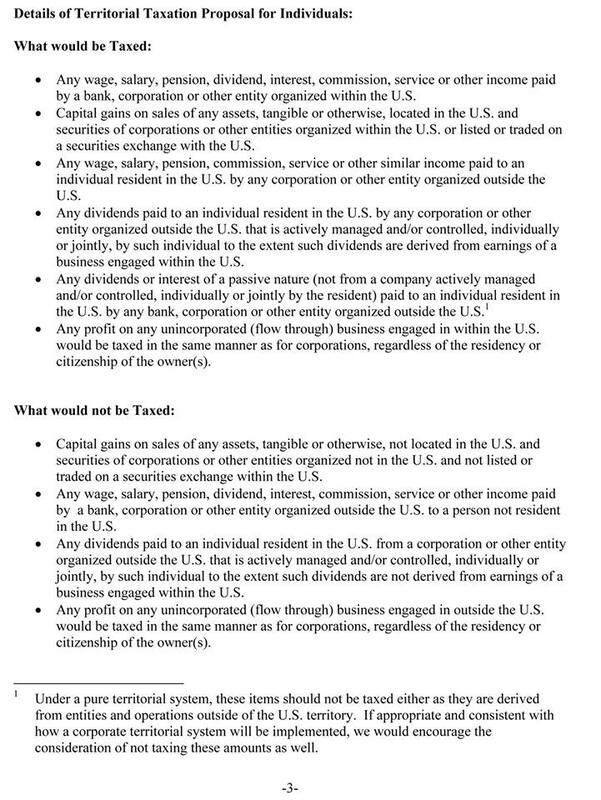 Taxing “Profit on any business engaged in the US” even for foreigners is pretty ironic, because big US businesses are expertly avoiding taxation in some countries by moving the profits to other countries with negotiated rates (see recent EU – Ireland case). So the proposal would forbid foreign companies from doing in the US what US companies do abroad. This proposal appears to have been written by people who reside in the US and want to bring home foreign profits tax free. This is a distraction from the issues that concern most of us here. @Fred (B). I think TBT is fair compared to CBT and the idea of saying RBT or nothing is insane. I will not purchase anything on Amazon or buy Starbucks because they have a tremendous presence here on my territory and are no doubt making profits but because they are resident elsewhere are siphoning untaxed profits out of my country. Congress WILL have CBT scored and whilst we believe it is zero revenue it will be scored positive and it has to be paid for because thats how Congress works. Under this plan ANYONE who does not invest in the USA will have nothing to do with the USA, no tax and no forms. We have friends that all have Junior ISA accounts which is often used as a tax free savings account. They are all invested in US Stocks. So my friends kids have investments in the USA that will be taxed nowhere but me and my family can not have Junior ISA accounts invested in EU stocks because it would be a nightmare. If Gustav in Germany makes 30,000 in profits in the USA in the market under this plan he pays 10,000 to USA and then takes a credit on his German tax for the tax paid. The USA will get the first bite and Germany gets second bite instead of right now profits in the USA are taxed solely by Germany. IF money is made in Ireland it should be taxed in Ireland, not in Luxembourg and not in the USA. Most Brockers want NOTHING to do with the USA ever again and that includes investing in the USA. This plan means no forms and no taxes. George the Original — Sorry but this TBT proposal smells fishy to me. It smells like, sorry to say it, something only a rich US-resident would think of. Not that I have anything against rich US residents with accounts abroad. Except that they are the ones, with their Swiss bank accounts, that have brought on FATCA for the rest of us. We can blame Obama all we want, if a large bunch of clowns hadn’t been trying to hide money in Switzerland, Deutsche Bank Belgium wouldn’t have closed yours truly’s €1500 account and told him to go to hell in 2014. And I’d not be filing with FinCEN. And probably not even filing tax returns either. And not be afraid of having a company in Belgium. 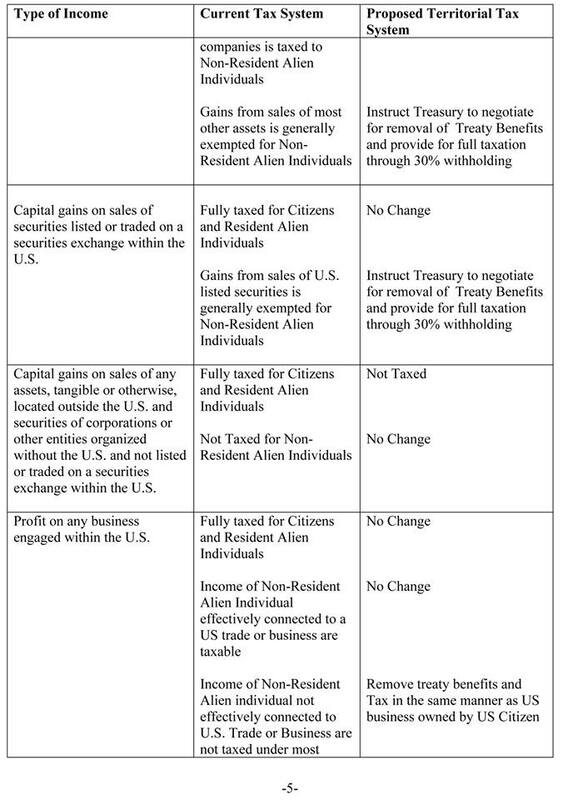 So if these people, whom I consider responsible for bringing on FATCA, now propose a TBT system that guts existing treaty protections just to make life easier for them, while forcing others to pay double tax (Gustav won’t get the German tax credit for US tax paid because the treaty protections will have been eliminated). Nope, doesn’t smell right. 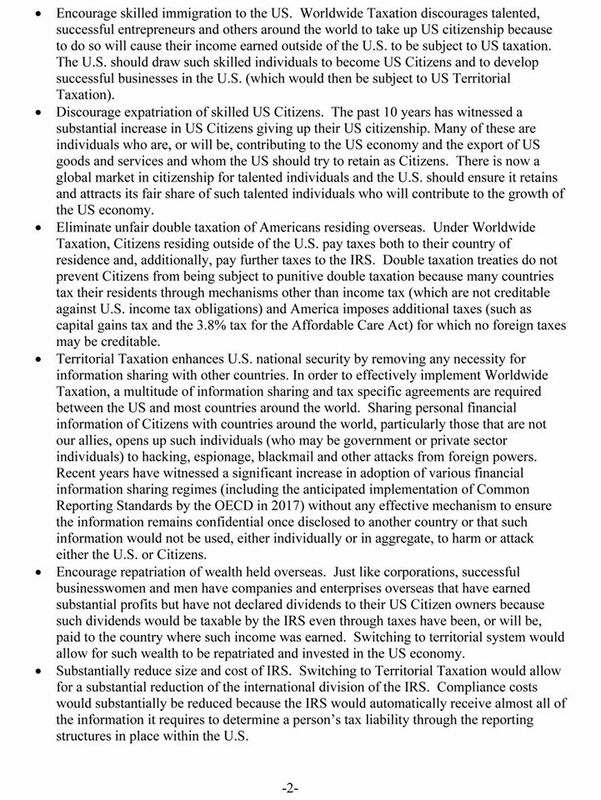 Also, where does the proposal say that it would do away with filing obligations and FATCA (it says something about not requiring information sharing in such a vague way — not good)? Because if it doesn’t change the need to file tax returns and FBARs, nothing changes for me or for most of us. I don’t owe US tax anyway. But I’ll admit playing devil’s advocate a bit. This TBT does provide that wages paid abroad to someone residing abroad will not be taxed. Big whoop for me, but good for those living in low-tax countries. Stephen Kish satisfied me on the FBAR filing part and my guess (wish it was absolutely clear though) is that 1040s would not be filed on non-US generated income since it would not be taxable under TBT. 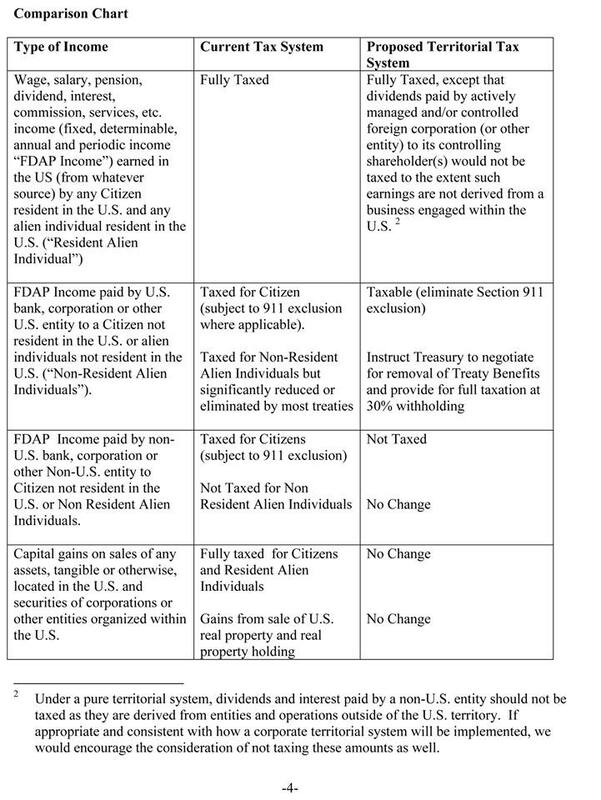 A 1040NR would be required for US generated income for both non-US-residing US citizens and non-US-residing non-US citizens. All US-residing US citizens and persons would of course file regular 1040s but how could such a snoopy species such as the IRS ever give up wanting to know what they’ve got and where it is overseas, after the Swiss banking debacle? Please lay blame where the blame actually lies. FATCA is a CONTROL issue and the US government is voracious in its appetite for control. The rich Americans hiding their assets abroad could have been tracked down by normal means. They were merely used as the excuse to make FFIs all around the world bow, scrape and investigate, at the USA’s command. So we’ve got CBT, RBT and TBT. As long as they take some TNT to CBT, I’ll accept either RBT or TBT but would prefer RBT since it truly is the international norm. Please specify Rich Americans? Are they the ones at home in the Homeland leaving their money abroad (who are guilty of tax evasion) or are they the Rich Americans living abroad with their money (who are guilty of tax evasion (but shouldn’t be considered guilty)). If I am lucky enough to win the Lotto Max (full $60M worth), my wife would become said “Rich American” living abroad with money. Of course, I will on the other hand take ALL that money and put it under my name since I am NOT an American and NOT subject to their piddly IRS rules. And even if they wanted to try and specify me as a Non-Resident Spouse – they’d get my middle finger. I meant rich Americans living in America. By America I mean the USA. Until my wife has the financial ability to renounce, she is still considered an American even if she is considered by Canada to be a Permanent Resident (with no intentions of going back to Mordor). “TNT to CBT”. That’s precious. And VERY funny. Thank you for the mid-week laugh. Speaking of humour, did you see the Trump press conference? Fodder for late night comedy for days to come, for sure. Cheers. Surely the amounts withdrawn from Junior ISA accounts will be taxed when withdrawn? Surely it won’t matter if the amounts came from capital gains or other kinds of deposits? I don’t mind that the US now gets to keep the correct amount of taxes withheld from dividends and interest paid by US payers. I don’t mind that it’s not refundable (like it was supposed to be when I was a US citizen but IRA employees embezzled the withholding and the IRS penalized me for illegal honesty). 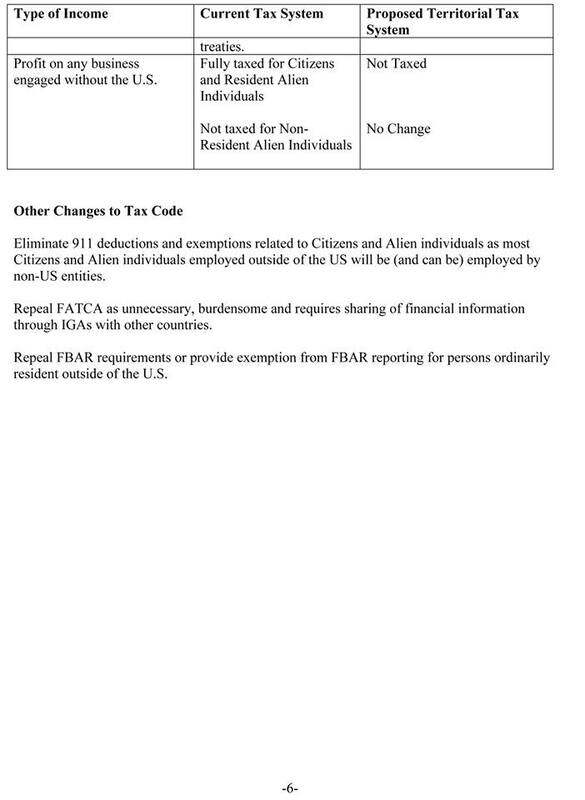 Brokers send me Forms 1042-S and I don’t have to do anything with them, I don’t have to compute impossibly complicated zeroes on US tax returns. I don’t even have to care that IRS employees are still embezzling from them. TBT is better than RBT, but as others have pointed out, this TBT proposal is too fishy. This TBT proposal deserves to get shot down. Maybe it’s a decoy so that RBT will be ignored, and after TBT gets shot down no one will even dare to propose RBT again. Anyone who hasn’t got out yet should still consider getting out before it gets worse. Thanks EmBee, that’s a step (not to have to file). I’m skeptical though. There’s much blame to spread around and one way US imperialism (I never thought I’d use this expression, but I cannot think of another one) exercices itself is through control of the world economy. The dollar itself no longer suffices, and FATCA is clearly a control issue. It is that because it is costly and inefficient. I still think that we are collateral damage (US citizens residing abroad) and that the US doesn’t care about collateral damage (the bombing of Laos for 9 straight years and the invasion of Iraq are but the most striking examples). If RBT had been in place, I wouldn’t care about FATCA. Except that it uses incredible arrogance and bullying to impose law on FFIs. Nevertheless those who were so imprudent as to get caught with the money in Switzerland deserve part of the blame. They gave the USG a pretext for FATCA. Would that if they were out to evade taxes that they had been smarter.